Male urinal, plastic, clear bottle with snap on lid and handle, flat base. Used by elderly or bed-ridded men and those with limited mobility. 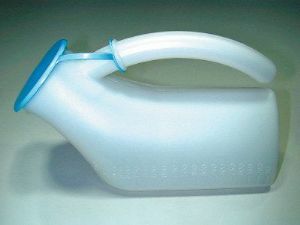 It is sometimes called portable urinal or plastic urinal. The urinal should be designed so that the contents can’t spill out. One packing list including Oxfam user’s notes securely attached externally to each unit with waterproof covering.